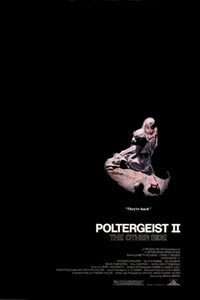 This disappointing (but watchable) sequel to the classic original (written by Steven Spielberg and directed by Tobe Hooper) attempts to highlight more of the origins of the family’s ghostly tormenting, when it wasn’t really necessary. A cool flow from the original's tagline of "They're heeere!" is, "They're baaack! ".